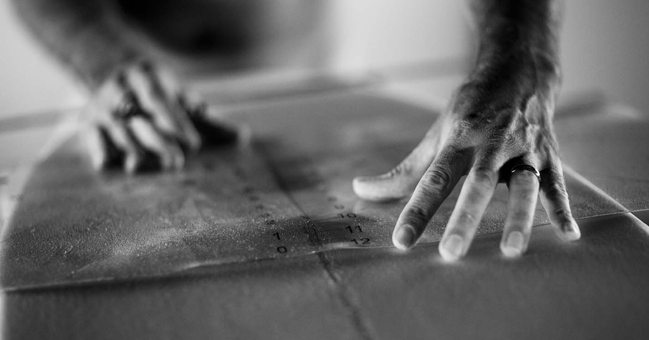 Mark Gnech working on a hand-shaped Vampirate Surfboards bottom. The bottom contours of your surfboard and how they are blended together, play a big role in how that board is going to perform. 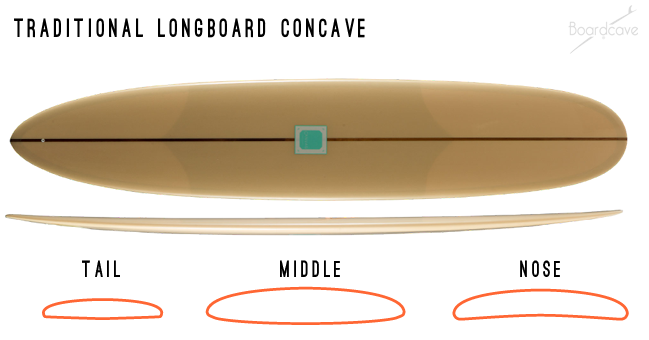 The idea of using different bottom contours is to produce somewhat of a controlled lift and drag effect, playing in to how and why a board will interact with the wave. 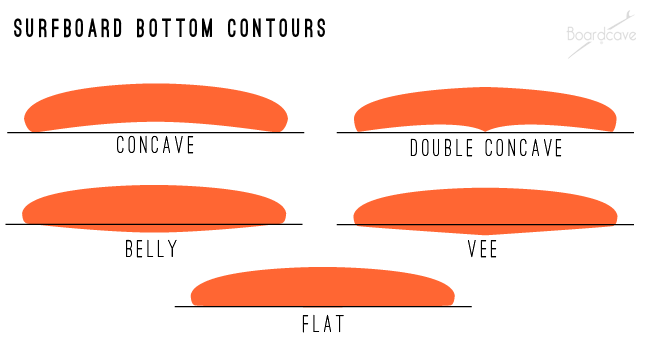 Just to keep things simple for now, we will focus on the three main categories that your bottom contours will fall into; Flats, Concaves and Convex’s. All boards incorporate at least one of these, more than likely blending them with the others to help dictate how your board is intended to perform. Once you establish what kind of bottom you are looking for, you can use the Board Engine to then compare similar surfboards to find the one that suits you best. Different bottom contours. Any part of the bottom that lifts above the rail line is a concave. Any part that dips below the rail line is a vee or belly convex and flats stay around the same level as the rails. Simply put, flats are just the flat sections of the bottom of your board. Generally, flats are fast but they do not offer much in terms of adding to performance except speed. They plain on the water, but they do not provide added lift, and they don’t contribute to directing water flow or providing leverage when performing maneuvers. They are often blending with concaves and convexes and are place strategically along the bottom of your board, giving you a section of your board that you can use for pure planing speed down the line. Just a few Grinder X models ready for their new homes with a grey Stamps Stubby sneaking in. Concaves are the areas on the bottom that rise above the rail line. Concave’s produce lift as well as laminar flow of the water under your board. They also slightly increase the overall surface area compared to a flat section, and can help get your rail to “bite” on the waves face. The direct front to back flow of water in an Album Surfboards single concave model the Destroyer increases your speed. Next to the controlled release of water flow out the sides you get in a Polyphonic with single to double concave. There are a number of different concaves. Single concave, double concave, tear-drop or spoon like concave (found on many nose rider longboards) to name a few. They all produce lift and direct the flow of water under your board, allowing you to sit more on top of the wave. With a nice down rail, you can have lots of control on good days, helping to keep the rail in the water. Asher Pacey stepping it up on his Sweet Spot 2.0. Convex contours, on the other hand, are any part of the bottom of your board that sits lower into the water than your rail. Found on a lot of longboards, displacement hulls and sometimes hybrids, these help the the transition from rail to rail, and can provide some forgiving stability depending on the board. Depending on the board, you may see convexes as: a smooth, rolled “belly”; hard angled Vee; or in various degrees of the two. The rolled “belly” can be seen on a lot of longboards, and blending into some hybrid style shapes. It’s generally found around the nose and running down the length of the board until it is blended into another contour. This can help keep the rails of your nose above the water line, preventing you from pearling…which is especially handy when doing out of some turns. Vees are usually found around the tail of any style of board, and help with control off your back foot, as well as assisting your rail to rail transition from the tail. 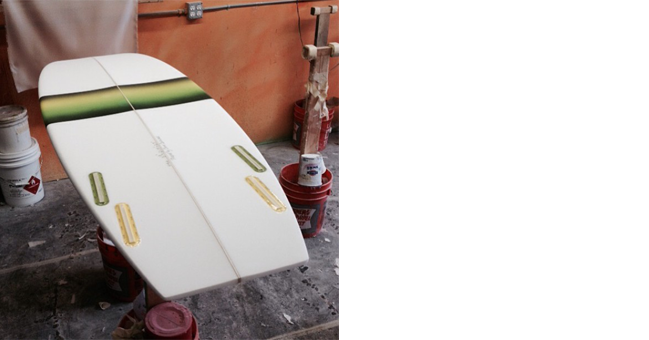 The traditional longboard belly contour in the front, middle and tail shown on the Canvas Surfboards Pinata. The way your board is going to interact with the wave is going to be partly due to how these concave are blended together. We will take a look a three basic examples of common combinations that you will find. (there are endless combinations, no one way is the “right” way, these are just examples). 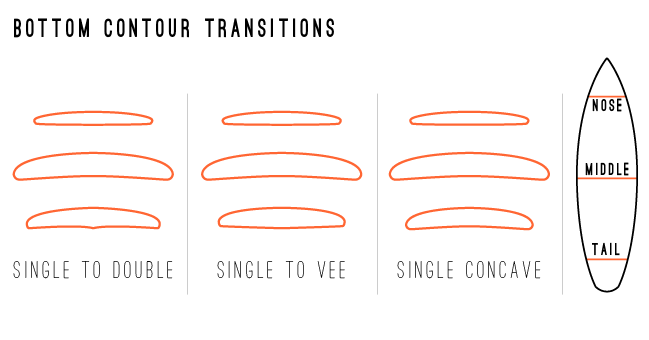 Some single concave transitions into doubles and vees. In many high performance shortboards, you may commonly find a somewhat flat section running through he nose, which many then blend into a deep single concave through he center of the board. This ay then blend into a double concave starting right around your fins, combined with a little Vee right off the end of your tail. The flat section will help while your paddling into the wave, it gives you an even surface to plane on when lying down on your board and trying to paddle as fast as you can. 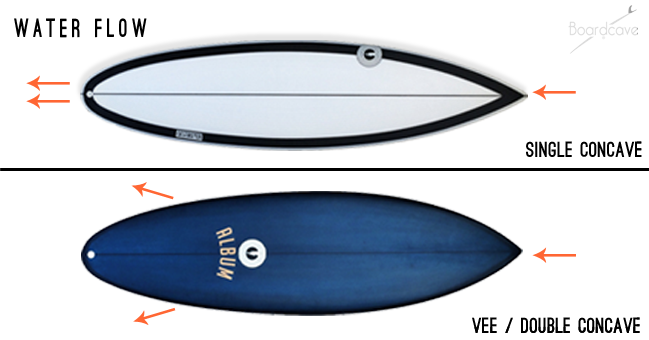 The single concave will help produce lift while you are up on your feet and riding the wave. It will also initially help set your rail into the face. This gives you both control and lift, keeping you on top of the wave while surfing. The double concave around your fins will redirect the flow of water through your tail and around your fins. This also helps create some lift and control when you are surfing off your back foot. Blending into the Vee right out the back of the board will add to your control and allow you to snap from rail to rail a little easier. Getting some air on a nice little Nation Surfboards model. In something like a hybrid shape, you might have a little “belly” in the nose, blending to a single concave in the middle of your board, blending to flat to Vee in the tail. The “belly” around your nose is going to displace the water while you are paddling into a wave, or when you are re-entering coming out of a turn. This helps keep the nose from pearling (going under the water) and is used on a lot of flat rocker boards. The single concave, again, will produce lift and help generate the speed needed when up and flying down the line. Blending into the flat to Vee out the tail, where the flat will help keep your speed up and the Vee will make it a little easier to quickly transfer from rail to rail. Perfect combo for smaller days when you still want to rip. 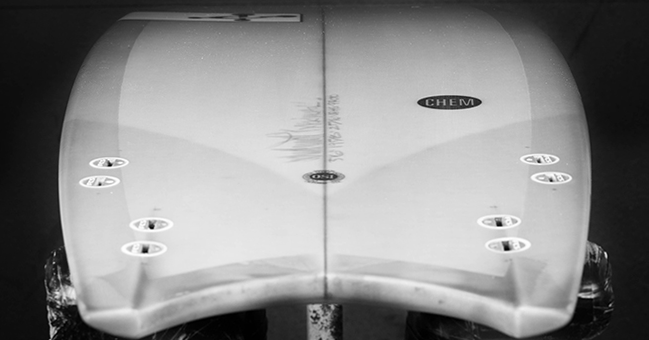 Close up of the bottom of the Experimental model by Chemistry Surfboards. Last, we will look at a traditional nose riding log. In this style of board you may find tear drop shaped concave in the nose area of the board, blending to a nice rolled “belly” through the center and then Vee out the tail. The tear drop concave in the nose will help create lift when you are perched up at the nose, as well as help with your control as it will allow you to use your rail a little easier when surfing the from this part of the board. The “belly” through the center of the board help give you some stability, and help provide smooth transitions from rail to rail. And once again the Vee coming out the tail help you pivot from rail to rail when trying to turn a little harder or re-direct the board. Just like in every aspect with shaping surfboards, there is no set way to take when approaching the bottom. There are endless possibilities and combinations that can be played with. Some are trusted and others might be best suited for specific style of boards. How they play into your board’s rail, tail and nose is also important to understand. There are many variations and other types of bottom contours that we will go over later, like channels, panels, chines, etc. that all have functional purpose in their own way. They all help control the flow of water, and the drag and release that can play into how the shaper intends a surfboard to perform. 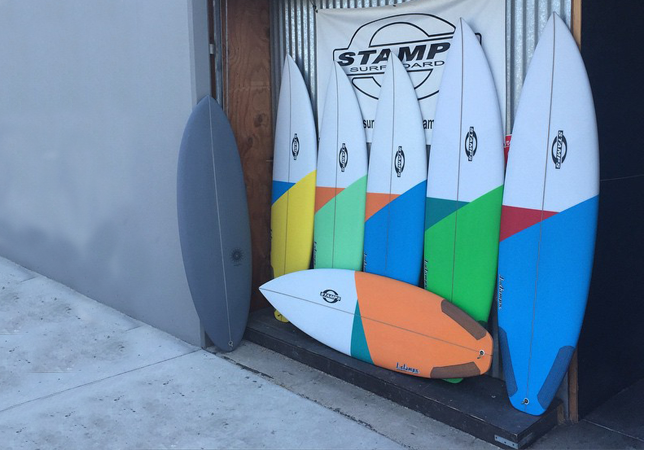 By understanding more about surfboard design, you can make a more informed decision about your next board.